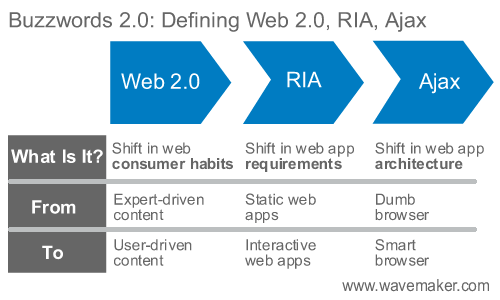 The Keene View on Cloud Computing: Buzzwords 2.0: What is Web 2.0? What is RIA? What is Ajax? The much-hyped but poorly defined terms Web 2.0, Rich Internet Application (RIA) and Ajax are best understood when they are defined together. Buzzwords represent job security for entrepreneurs like me who would be practically unemployable were it not for our secret knowledge of the true meaning of words like Web 2.0. However, even I must admit that these Buzzwords 2.0 get in the way of clear communication. Consumer eyeballs still rule the web. The huge power shift over the last 5 years has been from expert-driven content (which could be created using expert tools like Adobe Dreamweaver) to user-driven content (which requires web based tools that are easy to use). The shift in consumer attention is also driving a shift in business focus as corporations look at ways to engage more effectively with their customers and employees. In order for more people to participate in creating content for the Internet, the content creation tools have to be both simpler and more interactive. Rich Internet Applications seek to erase the difference in user experience between browser-based applications (Gmail) and traditional client/server applications (Outlook). A quick comparison of Gmail versus Outlook shows that RIAs have a big usability gap, but the Internet brings the offsetting benefit of dramatically simpler application distribution. The following diagram shows the fundamental changes between the Web 1.0 architecture (circa 2000) and the Ajax architecture. Web 2.0 is driving new application requirements and in turn creating a demand for new development tools that can meet those application requirements. Building increasingly visual and interactive web applications requires a WYSIWYG Ajax tool - something like a Microsoft Access for the Web. Flex and Silverlight, Adobe and Microsoft are providing proprietary tools for building RIA applications. For an example of an open-source tool for building RIA applications based on Spring, Hibernate and Dojo, check out WaveMaker . Download Wavemaker to see what a visual Ajax tool looks like! Wikipedia also lists a number of other Ajax frameworks for building RIA applications. Rich Internet Application. Adobe initially defined the term rich internet application. The Burton Group also has a good white paper on Ajax and RIA (registration required). Ajax. Jesse James Garrett of Adaptive Path originally defined Ajax. Good article but I found an error. "Adobe Flex and Micosoft Silverlight are providing proprietary tools for building Ajax applications." "Adobe Flex and Micosoft Silverlight are providing proprietary tools for building RIA applications." Flex and Silverlight (and Curl for that matter) are RIA solutions; not Ajax solutions. Richard raises an interesting point here. Just as there are few good definitions of Ajax, there are even fewer attempts to define what products out there are Ajax-compliant. Part of the reason for this is that Adobe and Microsoft are spending a lot of money to make it seem like they are part of the whole Ajax wave. They also have an army of trolls who gleefully stomp on any blog postings that do not robotically echo their corporate spew. To make things clearer, I would say "With Flex and Silverlight, Adobe and Microsoft are providing proprietary tools for building RIA applications". By the way, looking at the second graphic, aren't the arrows inverted? HTTP Request from server to browser? HTML file from browser to server? Uh? You made 2 very good suggestions and I edited the article to reflect them. I have always had trouble with getting my arrows to go in the right direction! Ajax is not a buzzword. this is a good post however controversial it seems. I do agree that Ajax is an RIA in and of itself. I may be way off base though.